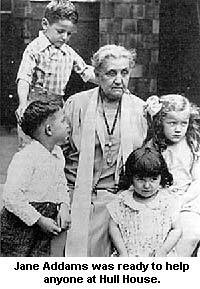 hen Jane Addams was a little girl about seven years old, out in Cedarville, Illinois, her father used to wonder why she got up in the morning so much earlier than the other children. She explained to him politely that it was because she had so much to do. Her mother was dead, but her father looked after the children very carefully, and to make sure that Jane read something besides fairy stories, gave her five cents every time she could tell him about a new hero from Plutarch's Lives and fifteen cents for every volume of Irving's Life of Washington. She would have read what he asked her to without a cent of pay, for she almost worshiped him. He was tall and handsome and a man of great importance in the west. Jane was very proud of him, and as she was plain, toed in when she walked, and had rather a crooked back, she imagined that he must really be ashamed of her, only he was too kind to say so. So she tried to keep out of his way. The Honorable John Addams (her father) taught a Bible class in Sunday-school, and Jane was so afraid it would mortify him if she walked home with him that she always ran ahead with an uncle, urging him to hurry. "My," she used to say, "he would be too ashamed to hold his head up again, if I should speak to him on the street." No one knew she felt this way, and she had been dodging him some years when one morning, over in the neighboring town, she saw him coming down the steps of a bank building across the street from her. There was no place to hide, so she stood there blushing and breathing pretty hard. But he lifted his tall silk hat to her, smiled, and waved his hand. He looked so pleased to see her that she never worried any more about meeting him on the street. Across the road from Jane's house was a nice green common, and beyond this a narrow path led to her father's mills. He owned two, a flour-mill and a sawmill. In the sawmill great trees from the Illinois forests were sawed into lumber. Jane used to sit on a log that was every minute being drawn nearer the great teeth of the saw and jump off it when she was within a few inches of the saw. Jane and the other children had great fun in the flour-mill, too. They made believe the bins were houses, and down in the basement played on the tall piles of bran and shorts as they would on sand piles. Jane's home was pretty and all the stores where she bought candy and toys were fascinating places. She fancied the whole world was pleasant and gay. She supposed that everybody in Cedarville had as good a home as she, until one day she went down in the part of the town where the mill hands lived. There the houses were shabby and untidy, the children ragged and dirty. They looked hungry, too. Jane ran home, and when her father came to dinner she asked him why any one had to live in such a pitiful way. He could not explain it so that she felt any better about it. "When I grow up," she declared, "I will build a lovely house right in the middle of those poor huts, so that the children may have something beautiful to look at; and I will see that they have clean clothes and good food." Only a few Sundays later Jane dashed into her father's room ready for church. "See my new cloak," she called, "isn't it handsome?" Her father admired it and then answered: "Yes, it is so much nicer than any other girl has that it may make some of the poorer ones unhappy. Perhaps you had better wear your old one." Jane was a child that could not bear to hurt another's feelings, so she hung the new coat away and wore the other. But as she walked to church, she asked her father why every child could not have the same kind of things. He told her probably there would always be a difference in the clothing families wore, but in religion and education there was no reason why all should not have equal chances. "And, Jane dear," he added, "I think it is a mistake ever to make other people unhappy by dressing too much." Jane never dropped her plan to have a fine house in the midst of poor ones. The back gave her a good deal of trouble as she grew older, and sometimes she had to lie still in bed for a year at a time. But she managed to fit for college and to graduate. Then she traveled abroad. But never for a day had she given up that house she had planned when she was a child of seven. Jane started to study medicine but was not strong enough to become a doctor. So she traveled some more, but she could never find a city where poor people were not suffering. It saddened her, and she said: "I can't wait any longer. I must have a few people made happy." So with a girl friend she went to the big city of Chicago and hired a fine old house that had been built by a millionaire, a Mr. Hull. This house had a wide hall, open fireplaces, a lot of windows for the sun to stream through, and was on Halstead Street. This street is thirty-two miles long, and in it live people from about every country in the world. Jane Addams made the house so cheerful and pretty that it was a joy to peep into it. Miss Addams and her friend asked the people about there to come in and have coffee and cocoa, read books aloud to them, taught the poor children to sew and cook, visited the sick, and made them understand--all these poor, tired, discouraged people--that at Hull House there were friends who wanted to help them in every way. By and by there were clubs for boys at Hull House, kindergartens for children, parties for old folks, and Halstead Street began to look cleaner, for Miss Addams went up and down those thirty-two miles of street and made it understood that she was there to help people grow healthy and clean. All the time, she was helping to nurse the sick and urging the rich people at their end of the city to come down to Halstead Street to see how the poor lived. At Hull House an idiot child or a drunken woman was helped as quickly and willingly as if they had been a clean member of the royal family. The more Miss Addams found out about what goes on in big cities, the harder she worked. She remembered what her father said about every one in this world deserving an equal chance, and she tried to help factory workers, mill hands, girls and boys who had done wrong, ignorant mothers who did not know how to keep house and take care of their children, men who were out of work, and the blind and crippled. Miss Addams's work set other people to thinking, and to-day there is hardly a large city but has built a handsome house down in the slums which offers help and comfort to the poor. But Hull House is the leading settlement house in the United States. Jane Addams still dresses simply. She does not care to have the best clothes in the neighborhood, or jewels, or luxuries for herself. She does not believe in talking a great deal about what she intends to do later on. She has found that the world needs busy workers more than ready talkers. She is a busy, good woman who has done noble work in America. She is still getting up very early in the morning, and I fancy that when she is asked why she rests so little, she gives the same polite answer that her father heard: "Because I have so much to do!"